Milton was a Christmas present. Two teenage sisters had received plenty of cards stuffed with cash that year, and they wanted something special, something they could enjoy for years to come—something more than a thing, actually. They wanted a new friend, a cute little pet to bond with, and a typical puppy simply wouldn’t do. Besides, the family already had a pair of dogs. FOR THE LOVE OF PIGS : Sue Parkinson spends the bulk of her day, every day, feeding and cleaning more than 60 pigs at her swine sanctuary in Solvang. In her down time, she tries to educate the public about deceptive sales tactics some breeders use to convince buyers that pigs can stay small and manageable. These girls wanted a pig. The word “pig” is usually associated with big beasts covered in mud, but the sisters did some research online and found pictures of little piglets—some pink, some black, others spotted, all absolutely adorable. Breeder websites promised that the pigs would grow no larger than 15 to 19 pounds and that they made terrific house pets, so the girls pooled their money and paid a Texas breeder $1,000 to ship a tiny pig to their home in Thousand Oaks. According to their mother, Stacey Lederer, Milton arrived on Jan. 21, 2012, and weighed just six pounds. He came with care instructions demanding that he eat just a half-cup of a special grain for pigs every day. After three months, Milton weighed 19 pounds, and the Lederers thought he was full grown. At this point, the instructions said they could up his feed regimen to a full cup of grain per day but no more. Lederer said Milton was incredibly sweet and smart, but he seemed to be perpetually hungry. He’d go crazy whenever the family ate, and the behavior didn’t strike her as that of an animal trying to score a bite of people food for fun. Milton squealed and charged their dinner table as if he were starving, she said. Other behavior problems began to emerge. The family couldn’t leave Milton alone or else he’d tear up the carpet and furniture. He fought with their dogs, even though the breeder promised that the pigs were raised around dogs and got along fine with other animals. The family worried that one of their animals would wind up getting hurt. Eventually, Lederer started looking for another home for Milton and came across the website for Lil’ Orphan Hammies, a nonprofit swine rescue facility operating on the Central Coast, just outside of Solvang. Its founder, Sue Parkinson, drove down to the Lederer house to visit Milton and assess his situation. Parkinson confirmed Lederer’s suspicions: They weren’t feeding Milton nearly enough. Parkinson also told the family that Milton would grow for another four or five years, to a size well beyond 19 pounds. The breeder had lied, Parkinson said. 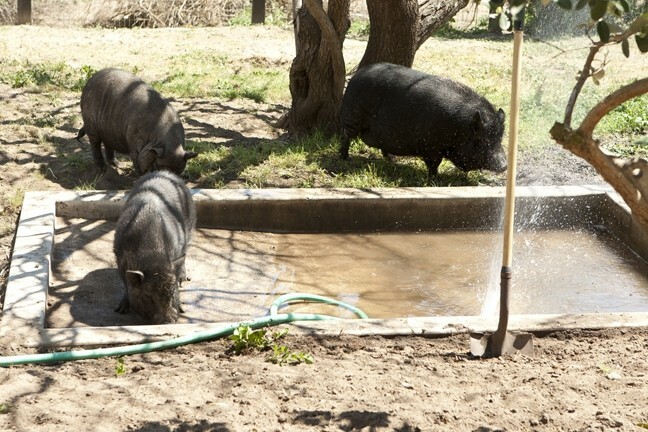 HOG HEAVEN : Pot-bellied pigs have plenty of space to roam, splash, and nap at Lil’ Orphan Hammies, a five-acre rescue facility near Solvang. Many were starving or abandoned before they were rescued. After the assessment, the family said some hard goodbyes and let Parkinson take Milton to her swine sanctuary. A year has passed since then, and Milton currently weighs close to 150 pounds—with a lot of growing left to do. The University of California Davis is one of the country’s premier veterinary schools, and the manager of the swine facility for its animal science department, Kent Parker, told New Times that the smallest recognized pig breed matures to an average weight of 90 to 100 pounds. They’re called micro-pigs, and they were developed by Charles River, a major medical research facility, in the 1950s. Parker said pigs are remarkably similar to humans, physically and mentally, which makes them ideal test subjects for pharmaceutical companies. Farm pigs, which normally weigh more than 1,000 pounds, were bred to be smaller and more manageable for testing. A hundred pounds was the most “micro” size scientists could achieve, he explained. New Times found a scan of a print ad online for Charles River’s animal breakthrough. It reads, “Bred for long-term studies, the Micropig eats like a bird. It’s clean as a whistle. And as light as a feather (12 to 16 Kg. )” That’s about 35 pounds. No matter the official weight, Parker said such animals are only made available to researchers. The swine commonly kept as pets are Vietnamese pot-bellied pigs, and they typically weigh anywhere from 125 to 300 pounds. Like people, pig populations can exhibit a wide degree of variation. Smaller adult pigs do exist, but they’re unpredictable anomalies. Runt pigs carry the genetic material to produce larger offspring, Parker said, so breeders can’t promise that a pig will be small just because its parents are. Also, pigs can make piglets well before they’re full-grown. They can mate successfully when they’re just four months old, but their skeletons won’t stop growing until they’re closer to 20 months, Parker said. Their life expectancy is 10 to 15 years, and, like people, pigs don’t stop growing when their skeletons do; they continue to add body fat as they age. Unsurprisingly, a healthy pot-bellied pig ought to have a potbelly. Breeders started marketing pigs with terms like “teacup” and “dandy” and “mini” in the 1980s, Parkinson said, and celebrities like George Clooney were photographed in major magazines with their pet “mini” pigs, sparking widespread demand for the little stinkers. Since then, interest has waxed and waned, usually coinciding with a celebrity adoption of the animals. Parkinson attributed the current spike in demand to superstar couple David and Victoria “Posh Spice” Beckham, whose 2009 pig purchase garnered much attention from the paparazzi. 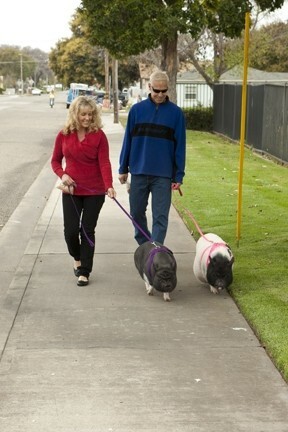 STRUTTING WITH SWINE : Joan and Mark Perry adopted two pigs from Lil’ Orphan Hammies and take them on walks around their neighborhood every day. They’re only a year old and still have a lot of growing to do. Dr. Max Conn of Pismo Beach Cat and Exotic Animal Practice said he doesn’t treat many “teacup” pigs, but he takes issue with the terms used to describe such animals. The people at Happy Acres Farms in Templeton would disagree. The farm is primarily used to produce goat-based dairy products, but the business is expanding to include the sale of pigs—small ones. As of press time, their active post on craigslist.org advertised miniature piglets for $1,000 apiece, claiming that the animals would reach a full size of 13 inches. Their expected weight isn’t mentioned. Not knowing she was talking to a reporter, an animal caretaker at Happy Acres said their pigs made great house pets. She said she socialized the animals by separating them from the litter and bringing them home before selling them. She advised against keeping the pigs outdoors and said they only needed to eat a quarter-cup of food per day. When New Times visited the farm, two litters of piglets were living in pens with their protective mothers; the seller said the breeders were two years old and full grown, weighing between 20 and 35 pounds. They were about the size of basset hounds, and though they didn’t appear to be malnourished, they certainly lacked potbellies. According to the seller, that’s perfectly fine, because they aren’t pot-bellied pigs. The farm claims to have registration paperwork certifying their breeds as Juliana and Gottingen, terms associated with teacup pigs on breeder websites nationwide. Parker, Conn, and Parkinson dismissed those breeds as nonexistent. The four breeder pigs at Happy Acres cost several thousand dollars apiece. Dr. Kristina Grewal of Creston Large Animal Veterinary Services told New Times that she’s examined the animals multiple times since they arrived at Happy Acres Farms two years ago and assisted with their breeding. She even owns a five-month-old piglet from a recent litter. According to Grewal, Juliana pigs are similar in shape to commercial hogs, but they can maintain a healthy adult weight of around 35 pounds. They aren’t supposed to have hanging bellies, but such fat deposits will develop if they’re overfed, she said. The Juliana Pig Association and Registry maintains that Julianas exhibit a wider variety of color, including spots. Any pigs with solid coloring and a mature weight of more than 69 pounds are disqualified from registration. The association strongly denounces starving animals to keep them small. After learning that New Times was covering the issue, the seller at Happy Acres Farms said she stood by the expected size of her animals and noted that the farm was new to pig breeding and wasn’t attempting to deceive anybody. The seller did admit that other pig breeders often engage in deceptive marketing practices, but said her animals are carefully selected and vetted for a much smaller size. A representative from the USDA didn’t return a New Times request for comment as of press time. Though piglets are available for purchase in San Luis Obispo County, they can’t be kept just anywhere. Grover Beach prohibits pigs except on two special parcels, and the cities of Pismo Beach and San Luis Obispo ban them outright. Paso Robles doesn’t allow pigs in any residential zones, and pigs can only live in Morro Bay if they’re on parcels larger than 20,000 square feet that are zoned for agriculture. Atascadero and Arroyo Grande allow residents to keep up to three sows and one boar on their properties, but they require a 100-foot setback. Lil’ Orphan Hammies houses more than 60 pot-bellied pigs on five acres, in several fenced enclosures and an abundance of converted dog houses, plastic igloos, and sheds. Parkinson said she began building the sanctuary in 1992 after she was duped into buying a miniature pig with plans to keep it in her house. Luckily, she had enough land to move the pig outside when it outgrew her expectations—but not all pet owners have that option. Walking through the sanctuary, Parkinson refers to the pigs by name, noting that each has a unique personality, and most have horrible back-stories. Sammy lived indoors for five years with an owner who followed her breeder’s feeding instructions to the letter. As promised, her diet kept the pig at 35 pounds, but Parkinson’s pictures showed that Sammy was little more than pink skin stretched tight over a clearly defined skeleton. She could barely grow a coat, and her hooves were a nasty shade of yellow. Trusting the breeder, her owner thought she was supposed to look like that. Only when she called Parkinson for zoning advice did she learn that Sammy was starving. Sammy moved to Lil’ Orphan Hammies in February 2011, and after five months of proper feeding, Sammy put on 45 pounds and grew a thick black coat. Her hooves acquired a darker, healthier color as well. Parkinson said Sammy’s growth was stunted by her poor diet, and she’ll never reach full size. Starvation works. The only downside is that it’s horribly inhumane, Parkinson said. Two of her pigs were found abandoned in a desert along with three others from the same litter. She believes they got too big to sell, so a breeder just dropped them off in the middle of nowhere. One was found with bullet holes in his leg. Another was mauled by a large dog. 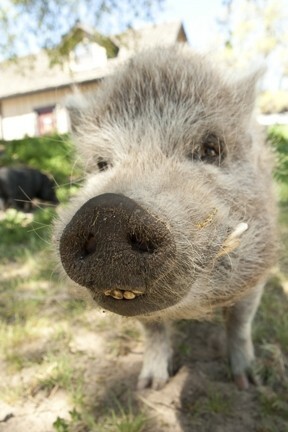 When she’s not caring for animals, Parkinson does her best to dispel misconceptions about “teacup” pigs. She runs a Facebook page, and she’s been featured on television and in National Geographic, but people continue to call her with pigs they can’t care for and questions about little pigs they want to buy. Her facility is perpetually at full capacity, but she makes room by adopting animals out. Before anyone can take a pig home, however, Parkinson inspects their property and makes sure they have adequate space. She also encourages people to take at least two, since pigs are social and exhibit behavior problems when kept alone. To that end, the Arroyo Grande Care Center, a nursing home with 99 residents, adopted two pigs on March 24 to be kept in the large garden behind the facility. Staff started a farm program in 2011 in order to add meaning and purpose to the lives of its residents, who handle the animals and grow their own crops despite mobility problems and dementia. Administrator Matthew Lysobey said the pigs are a welcome addition and that residents love to spend time in their pen. Also, the animals get to eat scraps from dinners that otherwise would end up in garbage cans. Joan Perry bought her first pig 15 years ago from a now-defunct pet store in Grover Beach. She said a clerk told her the pig would be about the size of an apple box, which wasn’t accurate at all. Perry has an ample backyard, though, and didn’t mind when the pig got big. She walked her to the beach every day until the pig died. She recently adopted two more pigs from Parkinson. One of her new pigs’ previous owners paid $6,500 for an animal that was supposed to live in her San Francisco apartment. The pig is only a year old and already weighs 65 pounds. According to the Humane Society of the United States, pigs are highly social and more intelligent than most domestic pets. They can play video games and understand mirrors. Mothers sing to their babes while nursing, and piglets have been known to change their behavior based on their mother’s mood. Pigs experience and understand joy, pleasure, fear, and pain in a manner very similar to humans.